Click here for example data file. This protocol describes how to perform a Western blot using the BioRad Protean 3 Cell system, one of many available Western blot assemblies. 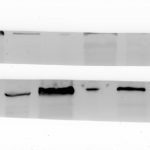 The basic steps of this protocol can be adapted to any Western blot assembly, but we recommend reading the instructions for your system first. This protocol involves use of methanol. Please review safety guidelines for methanol use, and be sure to discard methanol-containing solutions in appropriate waste containers.